This plugin allows you to restrict access to topic pages in a category. 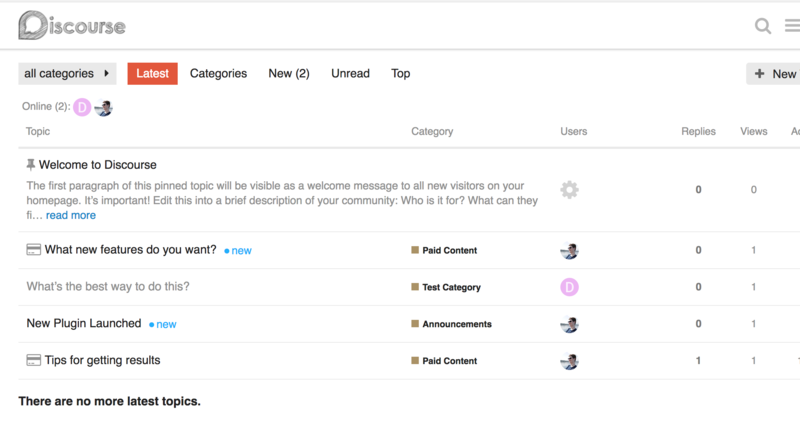 Topic titles will still show up in topic lists, search, user activity & digest emails. This is a great way to advertise the activity in a “members-only” category, which may charge for access. It IS NOT designed to keep the contents of the category 100% private - if someone is determined enough they will be able to piece together the content from search results. Once clicked, unauthorised users will be redirected to a defined URL (e.g. your payment gateway). This link can be internal or external. The static pages plugin works great for this. Thanks to @DiscourseMetrics.com for funding the development of this plugin. Is this new category access a feasible feature? "see topic title"
Ability to show topics in a category but not open? Can I make the topics visible to the public, but the contents locked unless you're logged in? 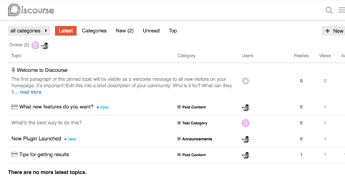 Is it possible to show a category for everyone, but hide the contents (requiring users to make a forum account to view)? category_lockdown_enabled: "Enable discourse-category-lockdown?" in this file? When the translation fits in one line, quotes are optional. Hi @david this plugin doesn’t appear to work with Discourse 2.1 anymore. I’m running the latest tests-passed version of Discourse with this plugin and not seeing any issues. Can you describe the issue you’re seeing in more detail? Are you seeing any errors at /logs/? The issue is although I set everything correctly, it just doesn’t work. Guests cannot see the private post topic titles. It was working about a month ago on Discourse 2.0.0 then we did a fresh install of Discourse and 2.1.0 popped up. By the time I got around to trying the plugin again it didn’t work. Same with Joe’s dl-teaser (similar plugin). As a matter of fact, it appeared that some of your settings were still showing up in Joe’s plugin setting for the category even though it was uninstalled. For this plugin to work, the category needs to be visible to the public in the ‘security’ tab. It sounds like you might have it set up as a secure category. Can you post a screenshot of the ‘security’ tab for the category? You’re right David. I don’t think I had it set to visible for public in the security tab. My bad. Thank you for the help! just checked in on this plugin (which looks exactly like what i’ve been looking for) and it looks like the build is failing. anyone using in production?